I finally got a chance last night to fire up my torch and make some beads. It has been a few months since I've made anything. I guess you have to start again somewhere. Ever since I started making lampwork beads I have left my jewelry creating days behind me. However, I decided to finally be more productive and pulled out my sterling silver findings and swarovski crystals. I made the minnie mouse style bead and made this charm, which fits Pandora style necklaces and bracelets. I really enjoyed creating jewelry again, so it looks like there will be more things to come. This silver striking glass, Clio, almost got the best of me. After a few months of getting nothing but a brownish amber color, I was excited when I pulled this focal bead out of my kiln. Finally, colors!! 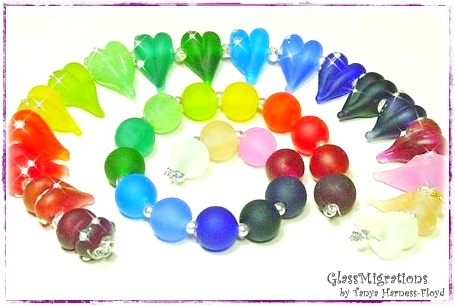 My next goal is to make a complete set using this silver striking glass. The necklace above was the bead soup ingredient's provided by Sissy&Jack's. Waiter! I Have a Bead In My Soup!! It is getting very close for showtime for the Bead Soup Party, hosted by Lori Anderson(Pretty Things). 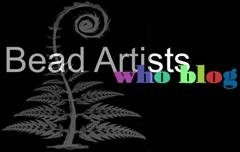 On February 26, 2011, everyone who signed up will have their jewelry creations, made from their bead soup ingredients, on display. I was so excited last week having received my "Bead Soup" ingredients from my soup partner, StacyHartis(Sissy & Jack's). The color scheme she chose is magnificant and her custom made copper focal is stunning. I'm excited about turning this into a beautiful necklace and am flooded with ideas. I intended to have the picture of the soup ingredients posted earlier and hope she can forgive me for the delay. I finally managed to send her the beads I made for her bead soup ingredient's. I kept changing my mind and finally just had to make a decision and go with it. The focal I created for her was a bit out of my comfort zone, but I still think it turned out ok.
Next time I post I will have a completed necklace, which will be in within the next few days. Wish me luck and Thank You Stacy for sending me such beautiful beads!! I have always loved these beads and of all the beads I have made in the past four years, this set is still one of my favorites. Something about the the etched rainbow colors, drizzled with Fine Silver (.999), has a beautiful effect. It was hard letting this set go when it sold, but I knew I could always make it again. 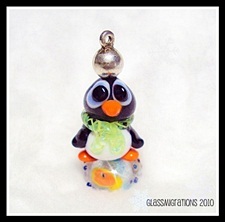 That being said, it is a rarity for a lampwork artist to buy another lampwork artists' beads, but I was flattered when this happened with this set. Even though I'm working with a better torch now, I still sometimes feel my beads were prettier when they were made with the less powerful torch, the Hothead torch. The HotHead torch was solely driven by propane, no oxygen involved, resulting in a cooler flame. A HotHead could mainly only melt the softer glass rods, COE104(Coefficient Expansion) and COE96. I have since upgraded to a BobCat torch. The BobCat torch creates a hotter flame since oxygen and propane are mixed at the surface of the torch. Since the BobCat torch burns a hotter flame, I am able to melt the soft glass as well as the harder glass, COE90(BullsEye) and COE33(Boro). 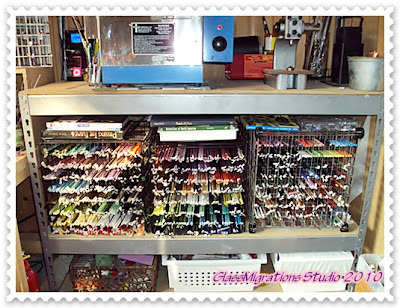 I intend to post about my studio in my next post, showing pictures of my studio setup and also all my different glass rods from Italy, Germany, and Switzerland. I will show a couple of pictures here right now, for those who would like to see the glass in rod form, before being melted into beads. I never thought in a million years I would be doing anything artistically related, especially in a profession, being the sole owner of my own glass studio. I graduated for East Carolina University with a 4-year degree in Business Education/Information Technology. I worked in the medical software field for a long time, as a software and technical analyst. Needless to say my life led me down an unexpected path, leading to my interest in making lampwork beads. I should have realized I was bound to show some type of artistic creativity in my life, being my parents are both natural artist's. It was kind of interesting having a father who double majored in Physics and Math, overseeing a nuclear powerplant, yet when he was home, he would paint some of the most amazing detailed shrimp boats I have ever seen. My mom was fluent with many art mediums; however, was most well known for her water color pictures. To this day, anything my mom touches turns into a beautiful work of art. I ran across this website the other day, Durbster, and found some of its contents quite funny. I'm always up for any humor, distracting from the everyday pressures of the world. Just click on the illustrated button below and the link will do the rest. Enjoy. Here is one more below you should watch. 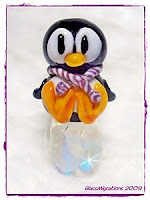 The other day I was looking at my past work and ran across some of my very first penguins I had made with glass. 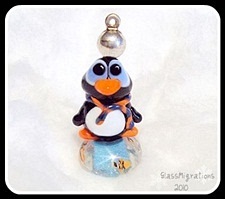 It is interesting how many different styles of penguins I have achieved over the past few years. I thought it would be fun to post them here in my blog, if for anything, for my own enjoyment.